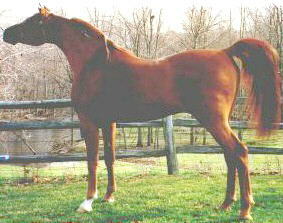 AZEEM IBN ROFANN, affectionately known as "Regal", is a straight Egyptian Arabian standing an honest 15.3 hands. He is proudly owned by Mike & Sandi Songer of Belle River Arabians, Santa Rosa, California. "Regal" was sired by the multi talented National Champion ROFANN and out of ANCHOR HILL ALYSA. "Regal" is a combination of both beauty and athletic ability. His Show career has proven his versatility with his ability to perform in a variety of disciplines to include, Halter, Country English Pleasure, Hunter Pleasure, Show Hack, Hunter Hack Over Fences, Native Costume, English Side Saddle and Western Pleasure. 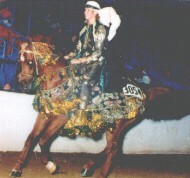 Pictured at left is Lisa Kartz and "Regal" in a Native Costume Class. Sandi Songer comments, "I would like to thank Lisa Kartz for her hours of work in helping us prepare "Regal" for his show career. The effort and true love she displayed, while working with him, have been the deciding factors for his success. I would also like to send a big thank you to Tracy Selby for her expertise in training both "Regal" and I in Country Pleasure. She had so much faith in us at the Egyptian Event and her confidence in us was inspiring!" BR, MAKING MAGIC. BR TAJ ROYAL, FOLLOW MY FANCY, ROSEBUD, EGYPTS KHAMAL, HG INDEPENDANCE, HG ZAPHOD and FSF CARERRA, have all been Futurity Winners and Futurity Champions.